Jerusalem Police arrested three Arab men suspected of hurling stones at visitors at the Temple Mount on Tuesday. One police officer sustained a minor head injury. Rioters also hurled shoes at police forces who escorted Jewish visitors in the area. Police forces increased deployment in the Temple Mount and around Jerusalem's Old City on Tuesday following information received on planned riots. The riots are a response to calls by right-wing activists to expand access to the Temple Mount. Earlier on Tuesday, the Rachel's Tomb compound was closed to visitors following the hurling of stones. Border Guard officers evacuated Jewish visitors. No injuries were reported. Stones were also hurled by Palestinians on Route 60 near Beit Ummar and were aimed at Israeli vehicles. Several cars were damaged, but no injuries were noted. IDF forces are scanning the area. Tuesday's riots prompted a response by settlers who in retaliation hurled stones at Palestinian vehicles in Mukhmas near Ramallah. One car was hit. 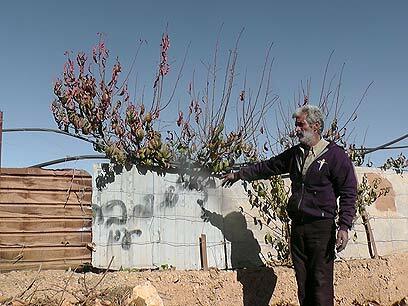 The IDF also discovered that 10 olive trees in Palestinian areas had been cut off. Tensions also ran high near Camp Ofer when Palestinian protesters gathered and demanded that Islamic Jihad terrorist and hunger striker Khader Adnan be released from custody. They hurled stones at security forces who responded with crowd-dispersal means. Despite Palestinian reports of casualties, the IDF was not aware of any injuries and stressed that no rubber bullets had been used in the clashes. Adnan later announced he was ending his hunger strike after learning he will be released from administrative detention in mid-April. On Sunday, police arrested 18 suspects in connection to riots in the Temple Mount Compound after hurling stones and chairs. Last week, tensions ran high following an ad suggesting that Likud member Moshe Feiglin will visit the Temple Mount together with his supporters. Fearing riots, police closed the compound to Jewish visitors. "The visit by Feiglin sympathizers to the Temple Mount is nothing new and takes place once a month," a senior police official explained. "What is different this time is the distribution of ads in the media calling for the site to be 'cleansed of Israel's enemies.'" See all talkbacks "Tensions run high in Jerusalem, West Bank; rioters arrested "